Guests were super excited to be able to experience/drive the newest Jeep, several months before they hit the showroom floor. Likewise, GG drivers were dying to get behind the wheel and be able to put the Cherokee through its paces.First impression highlights were the smooth shifting 9-speed transmission, electronic locking rear axle, and 8.6” of ground clearance. Many guests commented that they really like the aesthetics, ergonomics and interior styling as well. Overall, the response to the Cherokee was very positive. With the exception of a few original Cherokee owners (who mostly just wanted a different name for the new vehicle), people were really digging the new Cherokee. 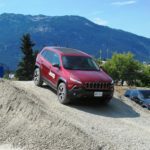 Also on course at Crankworx were the luxurious 2014 Grand Cherokee Overland and off-road killer 2013 Wrangler Unlimited. Alongside the off-road course was a Compass and Patriot street drive. 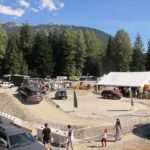 Jeep’s sponsorship of this huge event includes event space in Parking Lot 2 at the base of Whistler. Here, we were able to construct a full off-road course, complete with articulation bumps, mountain, log pile, rock pile and 35-degree tilt. We were right in the middle of a bicycle demo area and at the end of the Blackcomb farmer’s market. 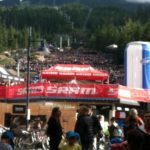 Overall, a great location to engage the roaming Jeep fans and thrill junkies that littered the small village during Crankworx. With a fully tented guest registration area and an amazing local staff of greeters, the event was an amazing success! 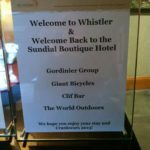 Of course, spending a couple of weeks working in Whistler/Blackcomb is never a bad thing. And being slopeside, watching the Red Bull Joyride wasn’t too bad, either!